To help consumers identify fresh, locally grown Northway produce on shop shelves, Northway has developed the Northway Grown fresh and local produce range. The Northway Grown logo has been created to represent a mark of superior quality local produce, to profile its local provenance and to assure both customers and consumers that their Northway Grown produce has been grown, harvested and packed in a sustainable, traceable and ethical way. The range that currently consists of Strawberries and Mushrooms is already set to be rolled out onto a number of additional produce lines in the future. 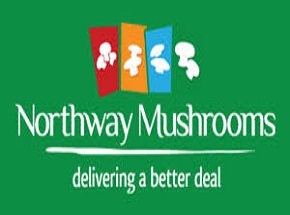 The Producer Organisation Northway represents five local strawberry growers alongside its twenty- nine mushroom growers. Collectively they produce over 32,000 tonnes of local produce annually. Established to support the work and effort of local family farms by improving quality and efficiencies, shortening the supply chain and getting their produce direct to market quicker, Northway encourage a collaborative approach amongst members to help them achieve their collective and individual objectives for growth and to assist them in the continued production of world class local produce, as efficiently as possible. Nurturing the Next Generation… Education is vitally important to the future success of Northway for local producers and for this reason, Northway has established the Fungi Growing Club. The programme is open to all primary schools in Northern Ireland, it adheres to the Northern Ireland Curriculum and is an innovative initiative aimed at facilitating and developing links between local business. It is Northway’s commitment to nurture the next generation of local business entrepreneurs by providing them with a better understanding of local business and hands on experience of developing their own mini enterprise through this fun, educational programme. To find out more, contact Elaine Shaw of Northway.